A former New York Senate candidate who sparked a firestorm after telling the I-Team he was planning to hand out "Kool Aid, KFC and watermelons" in Harlem was sentenced Wednesday to three to six years behind bars in an apartment rental scam where he stiffed more than a dozen renters out of more than $63,000. Jon Girodes, 38, was also ordered to pay $54,700 in restitution to his victims after pleading guilty on July 19 to multiple charges for falsely advertising a below-market luxury rental on West 42nd Street, collecting money for rental advances, deposits and fees from 13 potential tenants and then making excuses for why they couldn't move into the unit. In a brief statement in court Wednesday, Girodes said, "I'm sorry. I'm embarrassed, ashamed, words can't explain how bad I feel... I'm going to jail as I should." One of his victims, Amanda Stevens, was in court. She told News 4 New York she couldn't fully trust his apology. Girodes was indicted by a Manhattan grand jury in October on charges of grand larceny for stiffing renters out of deposit money for the midtown apartment and then left them with no place to live between August and September of 2016. Nearly a dozen people who responded to Girodes' Craigslist ad and were subsequently scammed spoke to the I-Team last fall. They say he told them he owned the 26th-floor condo in midtown luxury building with sprawling views of midtown, but made excuses about why they couldn't move in and left them homeless. Pierre Gooding, the attorney for the victims and a New York City Council candidate said in a statement that "we don't ever want to see criminals masquerading as public officials." "I am delighted Girodes received prison time and that my clients will receive restitution," he added. "It’s very important people like him don’t get away with scamming the public." Prosecutors also said that after Girodes took initial payments from the victims, he told some that a building manager named Irina required even more money before they could move in. But Vance's office said that no one named Irina worked for the building, and the building's actual management team had no idea about the overlapping leases he signed for the people he stiffed. 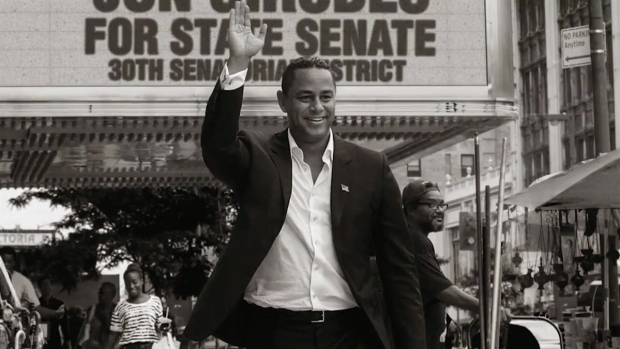 Girodes, who is Latino and white, according to his attorney, sparked a firestorm when, as a candidate running for a state Senate seat, said he would hand out Kool Aid, KFC and watermelons in the primarily black community in Harlem. Residents were outraged by the racist reference.